I specialize in working with knowledgeable individual investors and time-pressed business owners in all life stages and business cycles. 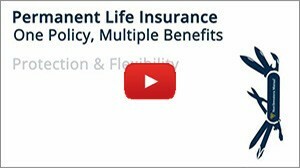 Responsible planning for the future is more than asset allocation and insurance contracts. It is my passionate pursuit to bring a global approach to the planning process. Others pay lip service to holistic planning; we bring action. Since 1986, my team and I have been serving the Chicagoland marketplace with innovative solutions and world-class insurance services. It is our belief that a certain chemistry must be obtained in a client relationship to catalyze long-term success. We do not presume to be all things to all people. We do believe, however, that by forming enduring relationships, we are available for our clients when they need us most. Most of our relationships start over a cup of coffee and lead to an overwhelming feeling of financial security. This is our business. This is our passion. "Help my clients turn their dreams and ideas into action that makes a difference." 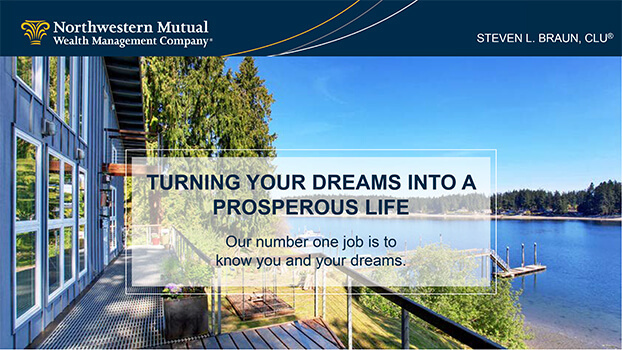 Steve Braun and his team focus every day on turning your dreams into a prosperous life through strategic, holistic financial planning. Click the links below to read more about the services offered, value proposition, and our network of local and national specialists. 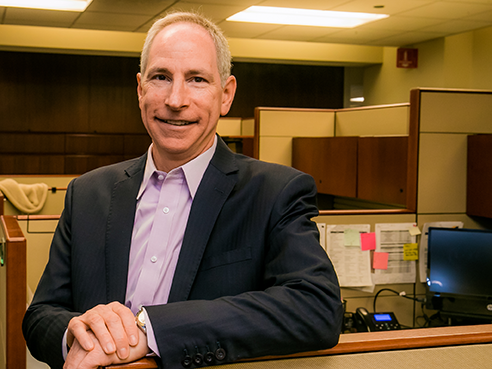 Northwestern Mutual is honoring Highland Park Wealth Management Advisor Steve Braun with membership in its Forum group, which recognizes individuals for an outstanding year of helping clients achieve financial security. 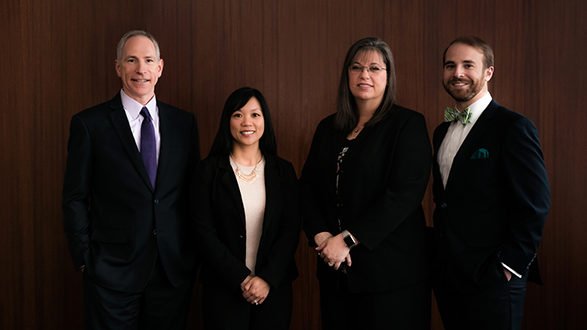 This is the 16th year that Braun has received the Forum honor, an annual award that only five percent of Northwestern Mutual's more than 7,000 financial representatives achieve. Northwestern Mutual - Chicago named one of Chicago's "Best Places to Work"
Northwestern Mutual - Chicago, formerly the McTigue Financial Group of Northwestern Mutual, received in 2018 its 11th consecutive ranking by Crain's Chicago Business as one of the best companies to work for in Chicago. The only other company to be ranked in the top 10 over the same timeframe is Google. In 2019, Steve will celebrate 33 years of service. To learn more about Steve Braun, visit the Professional and Personal pages of his website. 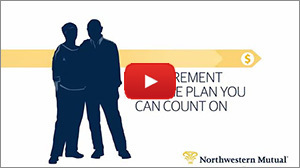 For the latest information on key financial planning topics, read our white papers or watch our short videos to learn more about how Northwestern Mutual can help you achieve your financial goals. 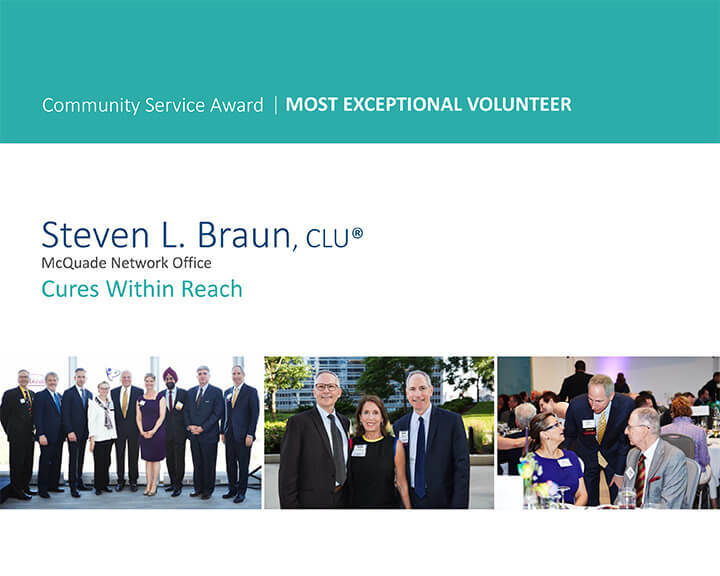 Northwestern Mutual Wealth Management Advisor Steve Braun recently received the 2019 Community Service Award as the Most Exceptional Volunteer in the Central Region for his work with Cures Within Reach. Congratulations and thank you for your volunteerism! Northwestern Mutual Wealth Management Advisor Steve Braun received the 2015 Community Service Award as the Most Exceptional Volunteer for his work with Cures Within Reach. Northwestern Mutual, through its foundation awarded $285,000 in grants to nonprofits nationwide. Congratulations and thank you for your volunteerism! 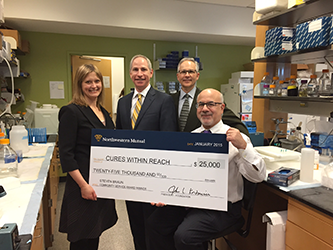 Cures Within Reach is receiving a $25,000 grant from the Northwestern Mutual Foundation in recognition of Wealth Management Advisor Steve Braun's outstanding volunteer involvement, as part of the company's annual national Community Service Award program. Braun is one of 26 financial representatives being recognized as top volunteers. Since the start of the Community Service Award program in 1995, the Northwestern Mutual Foundation has donated more than $3 million on behalf of its representatives to over 300 non-profit organizations across the country. Steve Braun was honored by the Northwestern Mutual Foundation with the 2011 Community Service Award for his extensive dedication to Partnership For Cures, a non-profit medical research organization that works to improve the quality of life for patients with life-altering diseases. A $10,000 grant was presented to Partnership For Cures to support the Patient Impact Initiative projects at the University of Chicago that repurposes approved drugs and devices to quickly create safe, effective, and affordable treatments. Steve Braun and the McTigue Financial Group teamed up to raise more than $32,000 of charitable contributions for local organizations in 2014. To read about the different charities and more, please visit Steve's Community Involvement page. Click here to learn more about Cures Within Reach. Click here to visit the Cures Within Reach fundraising page on Giving Library. 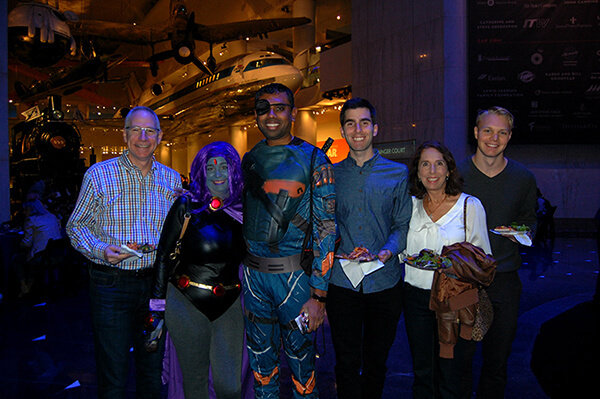 "Karen and I had a great time visiting with friends, clients, and colleagues at this year's Night at the Museum in Chicago. Thanks to all who attended and especially to those who coordinated this fun family event!" 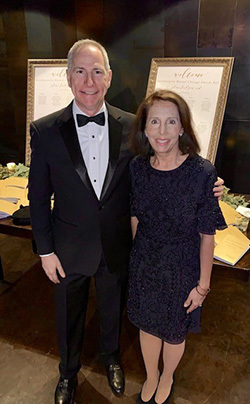 In February 2019, Steve Braun and his wife, Karen, attended the 2019 Northwestern Mutual Chicago Awards Dinner at the Morgan Manufacturer in Chicago. This year marks Steve's 33rd anniversary with the company. It was a very special night as over 300 colleagues came together to share honors for their impact in providing financial security and their leadership in the community. Today, Steve ranks in the top 100 in all-time career production in the company. Corey McQuade, the Managing Partner, gave Steve special recognition for earning Northwestern Mutual’s Most Exceptional Community Service Award for his work with Cures Within Reach. 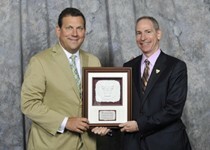 This is the 3rd time in Steve’s career he has received this prestigious community service honor. 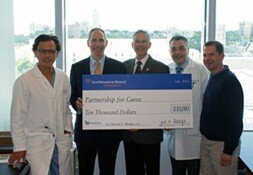 Click here to learn more about Steve’s work with Cures Within Reach. 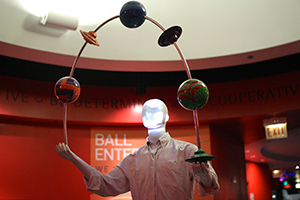 Steve Braun and Northwestern Mutual - Chicago hosted a private client appreciation event on Sunday, October 10, 2015 at the Museum of Science and Industry. 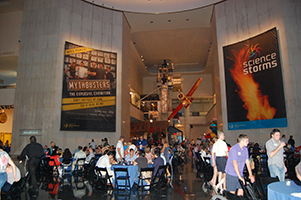 Our clients had exclusive access to all of the exhibits in the main space of the museum, as well as the flight simulators. 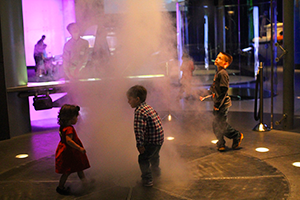 Along with a delicious dinner, everyone enjoyed a night of endless fun and exploring. 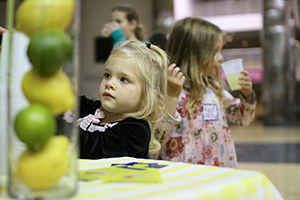 Funds raised throughout the evening were donated to nonprofit Alex's Lemonade Stand Foundation, Northwestern Mutual's research partner, to help fight childhood cancer. 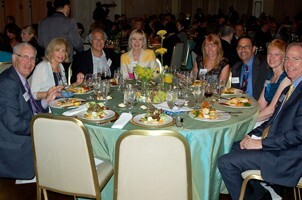 On June 17th, 2014, Steve Braun, as Executive Board member of the non-profit Cures Within Reach, hosted a table at their annual fund/awareness-raising event at the Standard Club in downtown Chicago. There were 300 attendees, and awards were given to honor leaders creating patient impact through their philanthropic, scientific and business efforts. 2014 awardees included Judy Goldman, of Goldman Philanthropic Partnerships, researchers from Northwestern University Feinberg School of Medicine working to repurpose an existing drug for Parkinson’s disease, and Dr. Norbert Riedel, CEO of Naurex Inc. IL Governor Pat Quinn stopped by to deliver remarks. On June 24th, 2013, 24 golfers took to the course in support of autism research at the Ravinia Green Country Club in Riverwoods, Illinois. The Longest Day of Golf, now in its 20th year, has been raising funds for research into new treatments and, since 2009, all proceeds have been managed by Chicago philanthropic organization, Cures Within Reach. 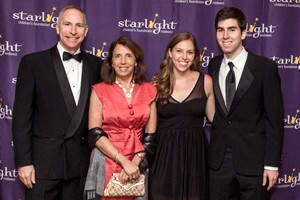 Fighting Childhood Cancer in the Chicagoland AreaSupporting Northwestern Mutual's Childhood Cancer Program, Steve Braun and his family enjoyed the Starlight Children's Foundation Midwest Chapter's 2013 Gala. Funds raised will help kids fighting cancer and their families forget about fear and find happiness. 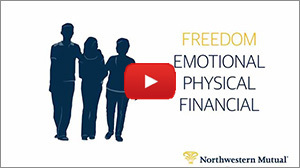 Learn more at nmfoundation.com. 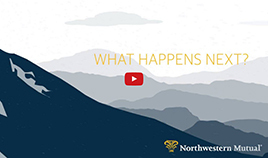 Steve Braun and Northwestern Mutual - Chicago, formerly The McTigue Financial Group, recently hosted a client appreciation event featuring Dan Buettner, a New York Times best-selling author and world-renowned explorer. Dan shared his observations for a longer, healthier and happier life from his book, Blue Zones, which was well received by guests. The 2013 Presidents' Symposium will be held on Tuesday, October 1st, 2013. The symposium is an invitation-only, annual, all-day event dedicated solely to presidents and CEOs. 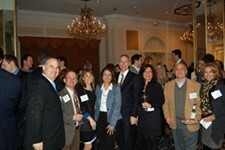 In 2013, Steve Braun will host the Chicago Chapter's 29th Presidents' Symposium. In his 23rd year on the advisory board and as an active board member of The Entrepreneurship Institute, Steve believes this program is unique because of the attention given to business owners telling their real life stories. A testimony to the success of the program is that 100% of attendees request to be invited back each year. Steve Forbes on "Rebuilding, Reviving and Learning From the Great Recession"
Northwestern Mutual - Chicago, formerly The McTigue Financial Group, hosted an event at the Standard Club with Steve Forbes, which focused on insights of the key lessons learned in the Great Recession, and how to rebuild and revive the economy. The event was part of a six-city tour and saw more than 3,000 attendees in total.